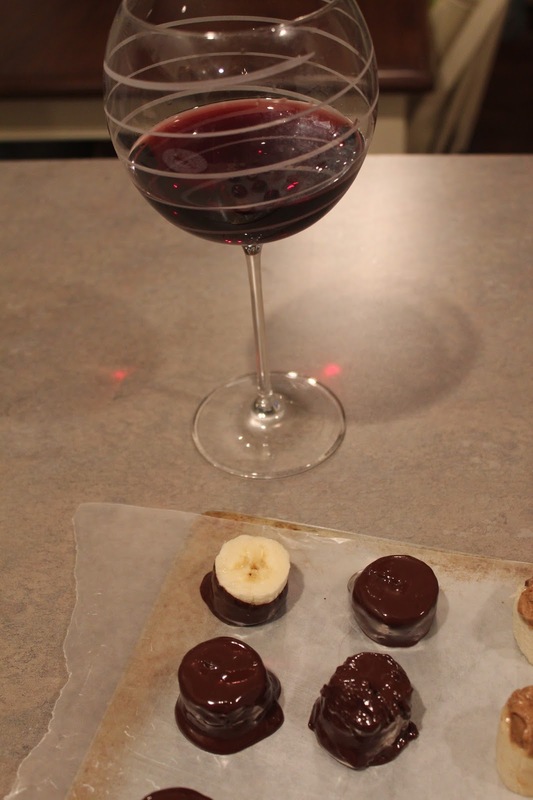 Have you guys tried the amazingness that is Dole's semi-new chocolate covered banana bites? Give me dark chocolate, banana, and maybe some peanut butter and I will be your best friend for life. I guess this means me and Dole are bff's right now (better watch your back Steph). Anyways, they are all the rage these days, which in turn means this girl is constantly searching high and low for them to not be sold out at our grocery stores (they can be found in the frozen section by the ice cream and such-in case you haven't tried these bad boys yet). When they are in stock, I feel like I just hit a portion of the lotto. Well, sometimes it takes a product being out of stock for my brain to fully kick on and say, "hey Katie, you do realize you can make these yourself, right? All it is banana's cut up, covered in chocolate, and frozen. Put those babies in your freezer and you're good to go!" ........OH, YES. Genius. Now, making these at home may mean that yours don't look AS pretty as the store bought ones, but hey, who cares if you aren't sacrificing the taste? Not me. They are pretty self explanatory...but you just want to cut up your banana's, melt your chocolate in a microwavable bowl (make sure to stir every so often so it doesn't get hard! 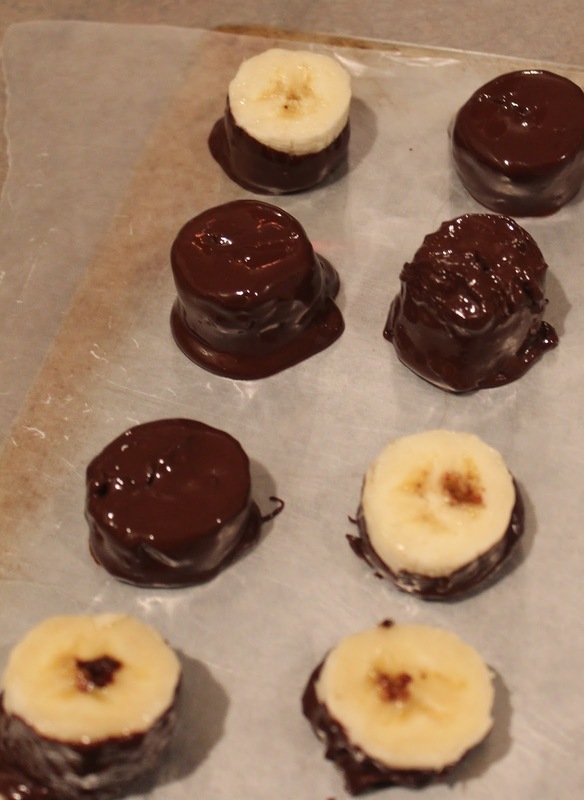 ), take a toothpick or a spoon and dip your banana slices into the chocolate to coat. As you can see, I did some of the slices fully covered in chocolate and some just dipped in them. I also did a few topped with almond butter! Place them on parchment paper on a baking sheet and stick them in the freezer overnight. I suggest experimenting with what you put on them...you can't do that with just buying the Dole kind. Take that, Dole. Some ideas: almond butter, sprinkles, peanut butter in between two banana slices (YUM! ), nuts...the list could go on and on. Who wants to come over and eat the rest of my stash? They are oh-so delicious. PPS-Does anyone have any tips for booking hotels? Where do you find the best deals? What are your favorite websites? YUMMO! I just had the Trader Joes ones last weekend....so delish! These look amazing! I'm definitely going to have to make some of these! MMMM I SO want to try these! They look delicious! And I was so jealous when I saw this on your IG on Monday night! I find them thankfully in my grocery store. They actually put them with the frozen fruit section, not the ice-cream section. I love it though. These look delicious! I might have to make some tonight. I think they'd be great dipped chocolate and then in chopped almond! Dole ain't got NOTHIN' on me! Oh Old Town!! How could I have left that off the must list!!! You can also get these chocolate covered bananas at Trader Joes too! I make these ALL the time lately bc bananas are so cheap at TJ's. I dip mine in choc and pb!! Oh hey most perfect sweet tooth dessert ever! 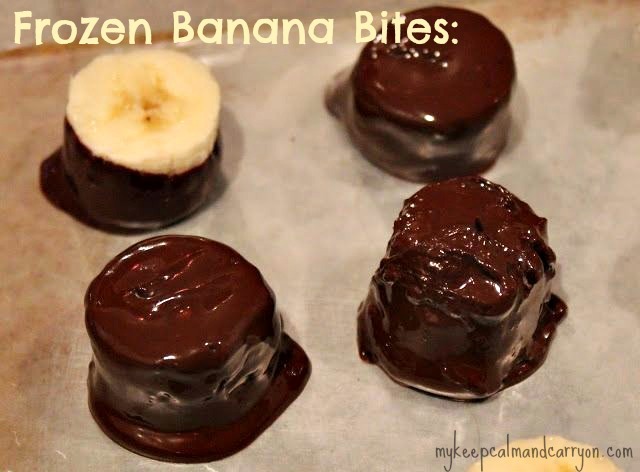 these look amazing, banana and almond butter is my favorite go-to snack but bananas and chocolate sounds even better! I LOVE chocolate covered bananas! Diana's Bananas makes great ones (Banana Babies), they have 1/2 bananas on popsicle sticks covered in milk chocolate, or dark chocolate, or milk chocolate & peanuts, & Banana Bites. I highly recommend them!! I get them at my local grocery store & their website (http://www.dianasbananas.com/our-products/#name-bites) has a store locator. What a great idea. I have seen frozen banana popsicles but I think little bite sized banana snacks are perfect when you want a little sweet thing.